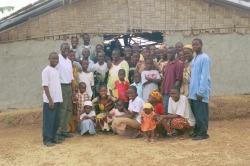 Thank you again for your donation to the Liberia, West Africa project. It is with a great deal of excitement that we take off for a long awaited adventure and work. We did it! With your help, we reached our goal of $10,000! I must admit that I am just as surprised as some of you may be. When Joseph set that goal in September, I thought it was unrealistic. Since this is an individually organized project and we are not able to solicit funds from businesses or organizations, I did not expect that we could raise that amount from individuals - our family, friends, colleagues, neighbors. I was wrong, and am glad to be. Many of you asked us about setting up a website/having a blog. To be honest, we have been so very busy with the details of the trip, fund-raising and working with the community in Liberia that the thought of adding one more thing to the "to do list" was daunting. However, one of our donors generously offered to give his time and additional funds to create a website for us. Thank you Gerald Charleston. Gerald also offered to post pictures and messages we send to him - providing that we have continued Internet access. We invite you to visit www.liberiaproject.com and feel free to pass it along to others. Please keep us in your prayers, cross your fingers, wish us well. We can use it all. Thank you for helping us to make a difference. All that is necessary for evil to prevail is that good men [and women] do nothing.